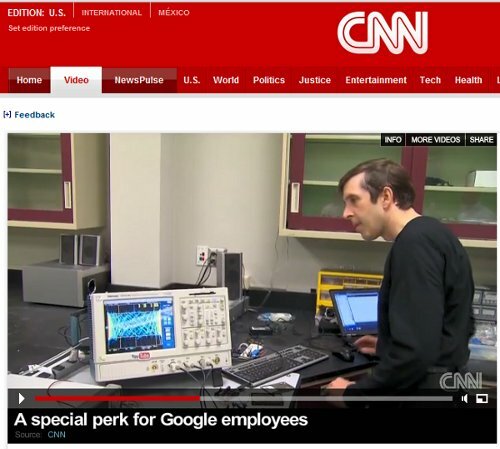 I recently wound up on CNN for a couple seconds doing some Arduino hacking as part of a segment on Google's workshops. Click the image for the full video. If you don't want to watch the whole thing, I appear at 1:00 and 1:39. This sketch manually generates two square wave output with periods determined by max1 and max2. The frequency of the second varies occasionally (controlled by the loop with t). I used simple R-C filters on the outputs to turn the square waves into roughly triangular waves, and then fed this into the X and Y inputs of the oscilloscope. The result was constantly-varying Lissajou-like patterns. I should point out the outputs generated this way are rather unstable because many thing can interrupt the timing loop. The above code is provided just in case your are curious. I don't recommend using this approach for anything real; using the PWM timers would yield much cleaner results. Anyone have other ideas for easy ways to generate cool oscilloscope patterns with an Arduino? Hi Ken, your'e wrong, you weren't on CNN once, I saw you twice! I found you when I was in a dark place with IR, your post really helped me, thanks again.